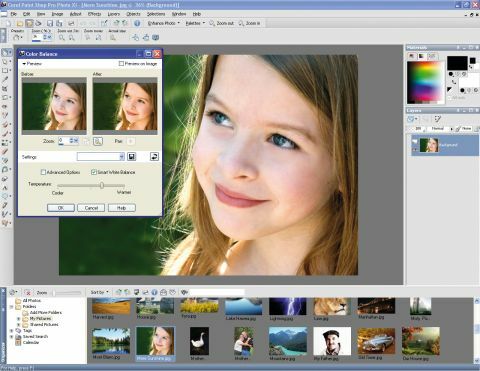 Paint Shop Pro PHOTO XI now includes an Organiser, a window allowing easy thumbnail browsing of your photo collection. Pick an image, then choose the Learning Centre option for whatever you want to do next: tweak a photo, retouch or restore it, add effects, whatever that might be. The program will provide the necessary explanations, so even beginners will soon be doing useful editing. Alternatively, you could just browse the regular menus, which are packed with useful functions. The problem-fixing options are particularly good (you get no less than four red-eye removal methods), if not as automated as in some other tools. Great editing tools include a colour changer that can automatically turn a yellow car red, for example, and new effects include the Time Machine (create a genuine old photo look), and a less successful but still handy depth-of-field simulator. It's a professional, but very usable, tool at an excellent price: recommended.